Every year I forget how much I love dates, then Ramadan comes around and BAM! I ask myself why I don’t eat them everyday? They have so many health benefits and are the base of one of my favourite shop bought snacks, the nakd bars, so today I have decided to share my recipe for dates and oat protein balls. 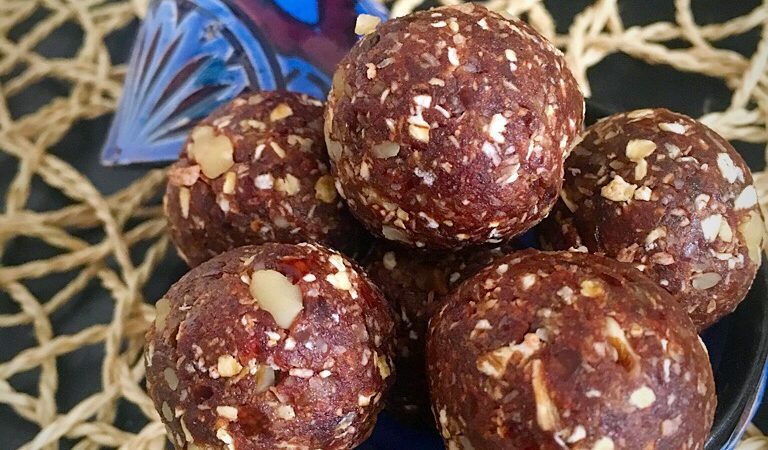 These protein balls are a perfect accompaniment for suhoor time or even as a normal day to day snack. I just adjust the size depending on what I want them for; bigger for suhoor and smaller for snack time. Especially now constantly busy with a baby and breastfeeding I find myself always needing a snack and these are perfect for helping me stay healthy. I personally don’t add any salt to them as I don’t think they need it but feel free to. The beauty of this recipe is in how it can be tailored to your preferences, don’t have any walnuts? Use whatever nut you have or like. Don’t like coconut? Leave it out. You don’t have to use medjool dates, but I personally prefer them when making my protein balls; also, as you may have seen on my Instagram, I recently got a big tin from The Date Project and couldn’t help myself. Chop the dates up and throw away the stones. Put all ingredients in a food processor and blitz until everything has broken up and you end up with a sort of sticky mixture. Shape into balls and enjoy straight away or leave them in the fridge for up to 3 days. Let me know if you try this, tweet me or tag me in your insta posts!